A good album is given away by an inspired cover. So does Tom Getter Slack’s recent release. I really like the inside drawings, representing physical principles of the looking glass. Seems like science and art mingled in the same music. The first thing I knew about Tom Getter Slack was the short but comprehensive description from his website: “Folk pop in the tradition of acoustic Beatles and soul searching Beach Boys, with great songwriting, lilting melodies, and nice guitar work.” It sounded nice and familiar to me. If it involved The Beatles and The Beach Boys to some extent, I thought it must be good. And so it was. I was pleased to discover Tom’s warm music. Serenity was the first word that came into my mind when I first heard his album. The songs are well-structured and full of positive vibes. They give you a good feeling of tranquility and inner balance. I really enjoyed songs like “I Remember Now”, “A Place for Two” or “Don’t Walk Away” for the pure emotions they conveyed. My favourite is “Your Love”, that caught my attention from its first chord. It’s now in my playlist, next to all my oldies love songs. 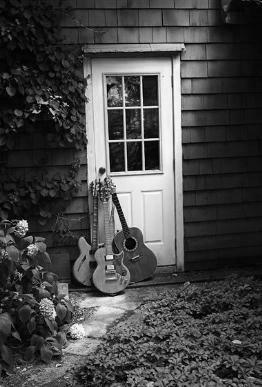 The guitar played a very important role in this album, being instrument, spirit and inspiration. It gave the lyrics a magical touch. The origins of this album can be traced back in the mid to late 00’s, when Tom returned to his home studio to record a set of reflective songs and haunting melodies written over the years that cried out to be properly captured. With the help of engineer and friend Jeff Buck, much time was spent polishing these into a shiny collection. Shiny indeed.